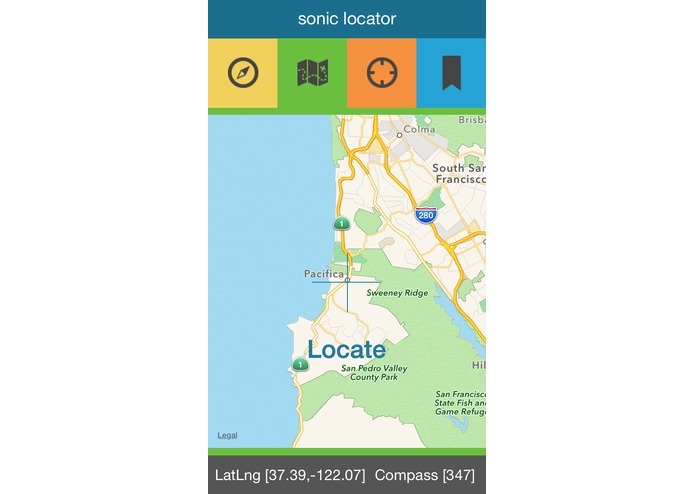 Built at YC Hack 2014, Sonic Locator is an iOS app that lets you understand navigation information through audio cues fashioned after sonar pings. The app is targeted at navigation in non-urban environments, where a destination may be known but it is difficult to maintain a straight path towards it. For example, in the ocean, wind, currents and lack of landmarks interfere with your ability to travel in a line, while in the wilderness, flora and geographic features rarely allow you to travel on the shortest path. Regular audio cues enable you to continue moving and adjusting to the conditions without being interrupted to constantly check maps and take bearings. Bearing (i.e. compass heading). Input your desired heading (from 0 to 360 degrees. GPS map (pictured). Center the map and chose your desired destination. Mark input (i.e. saved waypoint). When you are at a point you want to get back to, you can save it with the "Mark" command. Then later on you can get a vector back to the point. The app is constantly tracking your current GPS position and compass heading while in use. Once you have chosen one of the three "destinations" above, the app will calculate the path from your current position to your desired position in the form of a heading vector. Combined with your current heading, the app generates an a series of audio pings directed at you from the direction of your destination. This allows you to keep a spatial reference to where you need to go regardless of obstructions that may cause you to go off your path. In addition to outdoor navigation and orienteering on land or sea, Sonic Locator may have good potential to teams venturing in unfamiliar areas, such as search and rescue or military applications. Directional audio to augment reality is something that hasn't been explored a lot in regards to collaboration - if a group of people can have an auditory cue of the locations of their teammates, they can work together more effectively. Finally, an extension of this technology combined with microlocation could be used as an assistive technology to the disabled. Don't forget to put your headphones in the right way!